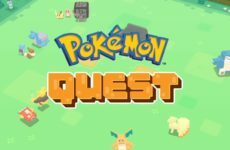 Release of Pokémon Sun & Moon Crimson Invasion Almost Here! 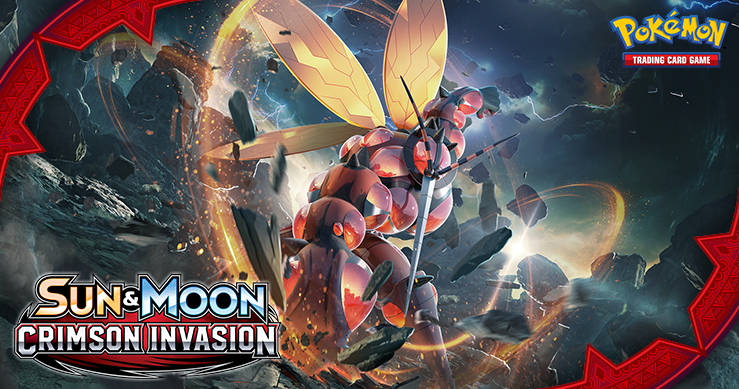 Pokémon Sun & Moon Crimson Invasion is being released this week, bringing 111 new cards, Ultra Beasts and new Pokémon GXs into play. 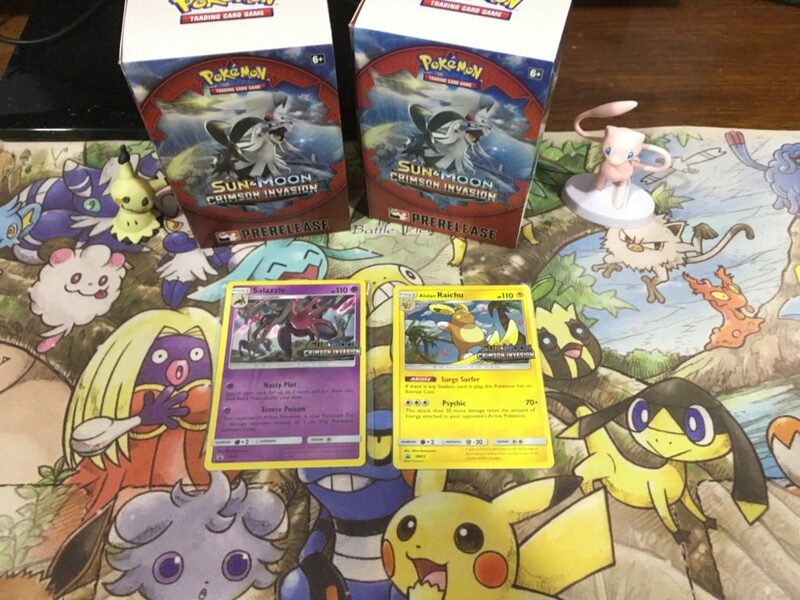 Over the last weekend, we were graciously invited by Cards & Hobbies (C&H) for their pre-release event. 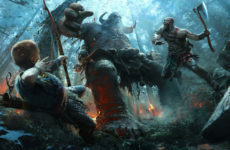 C&H is the only card shop in Klang Valley that held the pre-release at midnight, which allowed busy fans to be able to play despite their packed schedules. Upon our arrival, we were greeted by Michael and Aaron. The shop is well stocked with Pokémon and Magic The Gathering products as well as a myriad of accessories. I couldn’t help myself but to browse through their accessory section right next to the counter. Those cute Pokémon themed sleeves and Ultra Pro card albums sure look good. At the midnight pre-release, there were a total of 16 attendees, which was enough people to have a fun game. The pre-release is conducted Swiss tournament style. Each player is required to build a 40 card deck using a pre-release kit that includes a 22 card evolutionary pack and 4 booster packs. The pre-release is a fun way to get started or get back into the game as it is less competitive and enables everyone there to have fun. As a fresh player, you will be able to learn under a more relaxed environment. 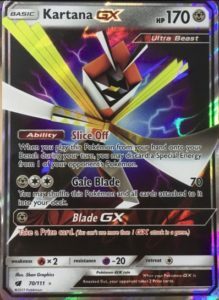 Lucky for us, we had some experience from joining pre-release events for previous expansions, so we knew immediately that we would be looking for a GX card to build a 40 card deck around it. To our surprise, we had a Kartana GX. ws you to cycle fast enough and find it, you can play the card to the bench again from your hand and trigger its ability “Cut Down”. 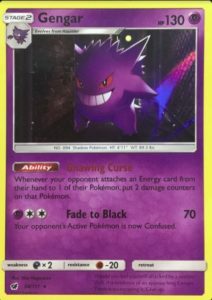 It allows you to discard a special energy that is attached to your opponent’s Pokémon. We didn’t manage to win multiple games, but we had a lot of fun with the new cards and meeting new people. At the end of the session, we left with another 4 packs for participation. To those who want to join a prerelease for the next set, please bring card sleeves to protect the cards from wear and tear and some dice as damage counters. Thanks to Cards & Hobbies for inviting us and Aaron for judging the session we were in.